Heat a large sauté pan on medium heat add the oil. Once oil is hot sauté the onions, garlic and ginger till soft, and then add the spices. Lower the heat and cook for additional 2 minutes. Remove onions from pan and place in a large baking dish or 2 9x13 inch pans. In the same pan, raise the heat back to high and sear the chicken for a few minutes on each side till brown on both sides. Place chicken in the baking dish on top of onions and set aside. In a small bowl mix the broth, honey, cilantro, cinnamon stick, prunes and apricots, and pour it over the chicken. Cover the chicken tightly with foil and bake for 45 minutes. Raise temperature to 400, uncover baste the chicken and bake for another 20 minutes to get golden brown. 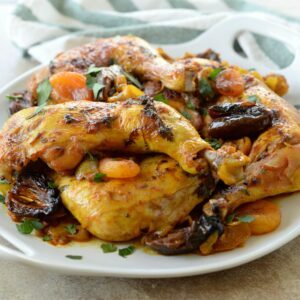 Recipe by Naomi Nachman- As cooking has always been her passion, in 2004, Naomi started her own kosher personal chef business, The Aussie Gourmet, to pursue cater weekly and Shabbat/Yom Tov meals for families and individuals within The Five Towns and neighboring communities and beyond — including Alaska and Israel. Naomi also hosts her own weekly show, “Table for Two with Naomi Nachman” on The Nachum Segal Network – which covers all food-related topics. In addition, Naomi writes a monthly column for the Mishpacha magazine covering food trends, and is also a contributing editor to The Jewish Home newspaper distributed in Long Island, Baltimore and California writing weekly articles and recipes.